We all have archetypes that spur us individually. Our backgrounds, our struggles, our loves, loyalties and rivalries combine to create passions, positive and negative, that charge us. These are passions that energize rather than enervate. Because of these personal experiences and passions, each of us have genres that are intensely meaningful, story types to which we return again and again. I have two. One is “The Joseph Story” which is any story that follows loosely the account of Joseph from the Old Testament. Favorites that fall under this particular archetype are Close Encounters of the Third Kind, Field of Dreams, Heaven Can Wait (1978 version)andDisney’s Beauty and the Beast. Each of these four, while wildly different movies, follows a similar storyline concerning a dreamer with a vision. In the face of events that drag the character further and further from this vision ever being achieved, the vision miraculously comes to fruition in the end, albeit in an often different way than imagined. It’s a wonderful archetype I’ll write about at a later date. The second story type that drives me revolves around justice. There are a couple of therapy sessions we need not explore here that would explain why I am obsessed with justice…. not particularly for myself but for the people around me and others I encounter in the world. Consequently, movies that explore justice are some of my favorites of all time, movies I will watch again and again and again. Examples here include Erin Brockovich, In the Name of the Father and Norma Rae. (There are quite a few others I could list.) Each of the movies mentioned are splendid movies even apart from my justice obsession. Erin Brockovich is a wildly entertaining movie, more fun than any such movie has a right to be, a movie that cemented Steven Soderburgh’s status as one of the best directors in Hollywood, and a film that plays out in highly original ways while still being very much a crowd-pleaser. In The Name of the Father is simply one of the best movies of the 90’s and would have swept the Oscars in ’93 had it not been for a juggernaut called Schindler’s List. Norma Rae is a surprisingly gritty, wonderful film that holds up beautifully even today. I love these movies passionately and will show them to anyone, anytime. Yet there is one ‘justice movie’ I return to more than any. It’s a movie that had one of the biggest influences on my life; it is also one of the top 5 movies ever made. 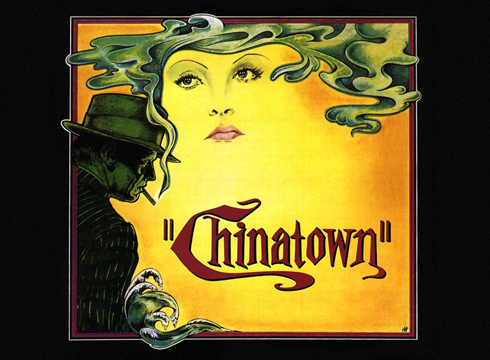 That movie is Chinatown.